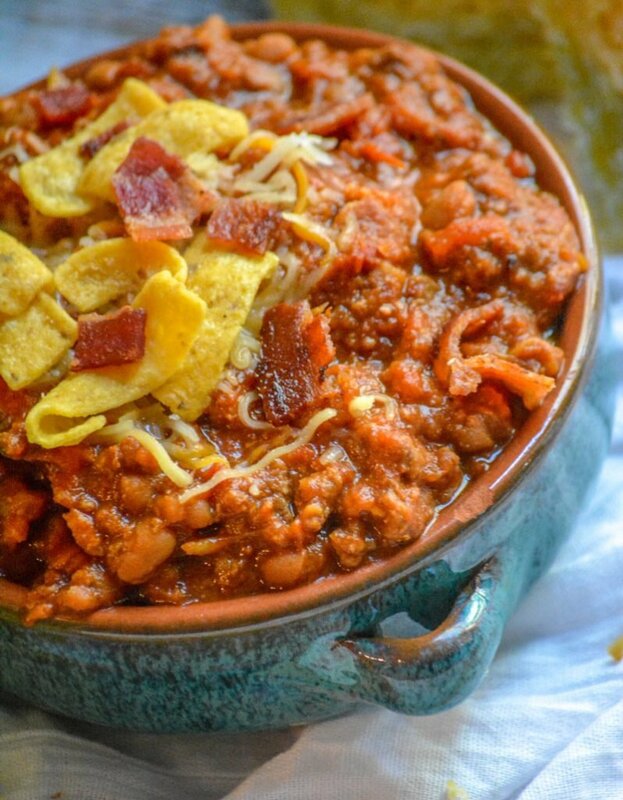 There’s nothing I love more than a good bowl full of chili when the temps start to drop. It always hits the spot. How can you go wrong? 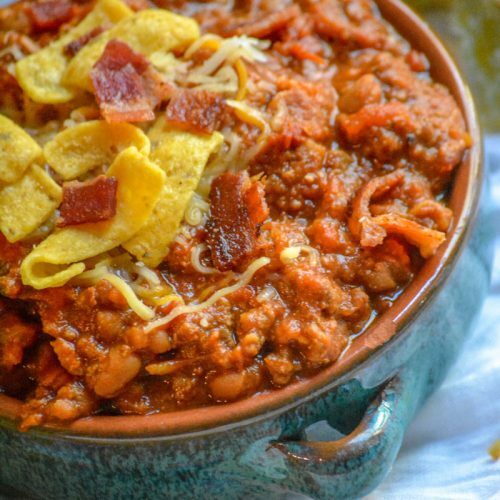 It’s the ultimate cold weather comfort food. 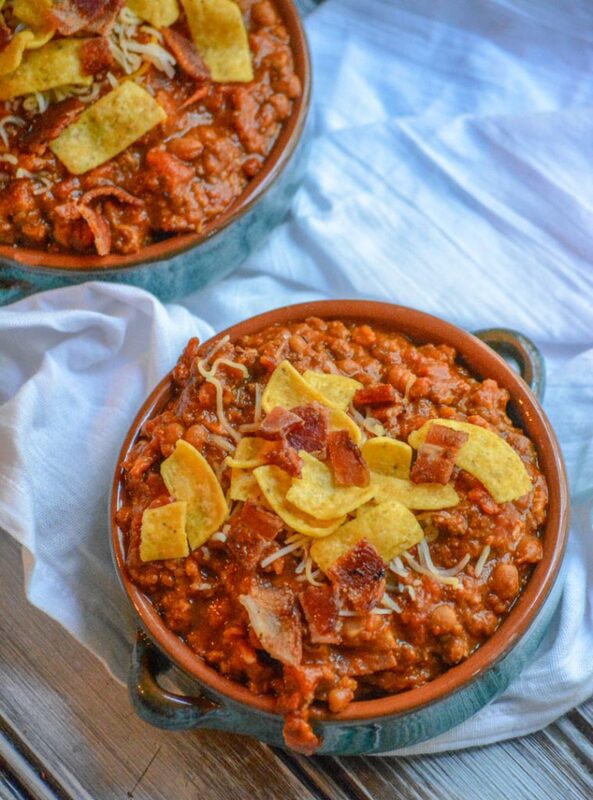 A big bowl full of beans & beef in a seasoned, simmered tomato broth and of course topped with copious amounts of shredded cheese, a dollop of sour cream, and some sorta crispy bits. It’s magical. Naturally we have our standard versions of this dish, but once I started cooking for a living- my horizons broadened. Baked beans are pretty much every Southerner’s bread & butter. We all have our own recipes. They’re a staple at every cook out and barbecue. You could spit farther than you could go without finding multiple different versions of the same Summer side dish. Despite all this, I’m one of those weirdos that still almost always serves my baked beans from a can. I mean, if it’s worked this long, why rock the boat? Right? I know I’m notorious for shaking things up, but this is one dish I do not have a tried and true recipe for. When my best friend kept touting her baked bean recipe, I was skeptical. When she brought a baked bean based chili to our cookout, I didn’t even know what to think. I mean beans are essential to any good chili recipe. They’re the basis for the magic that’s gonna happen. But baked beans? I just couldn’t picture it, or taste it. Even using canned beans, there was always one element that had to be added. Bacon. Yes that’s right. Bacon is always right. Bacon unarguably makes everything better. So, we’ve got bacon & baked beans. A solid side dish on their own, but with the potential to be an amazing. Just given a little love and attention! 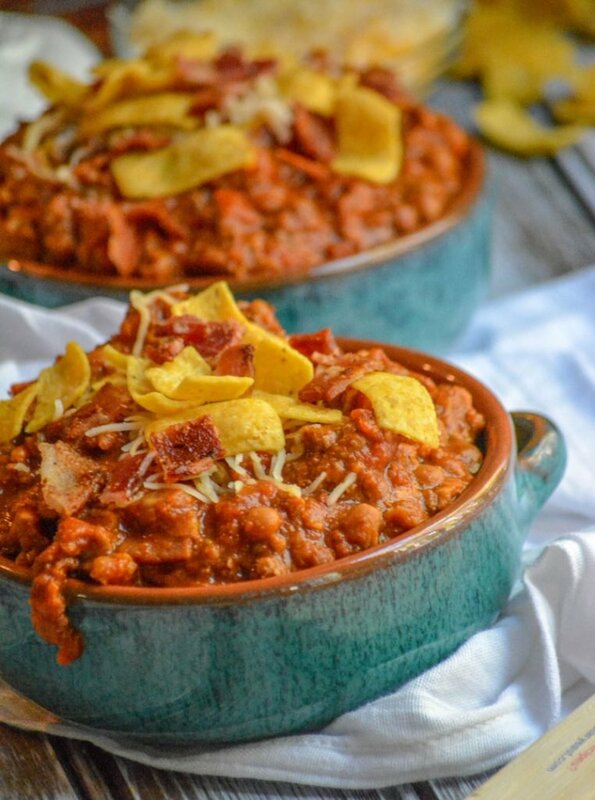 This chili starts the same way any other traditional chili begins… with a bit of ground beef, cooked and crumbled in a stew pot. Except with this one, we’re going to add in bacon and diced white onion. That mixture is stirred, broken up, and stirred some more until it’s all cooked through. Drain the meat mixture of any fat. Transfer the meat mixture to a large soup pot, then add in all the remaining seasonings & ingredients. Bring the pot to a boil. 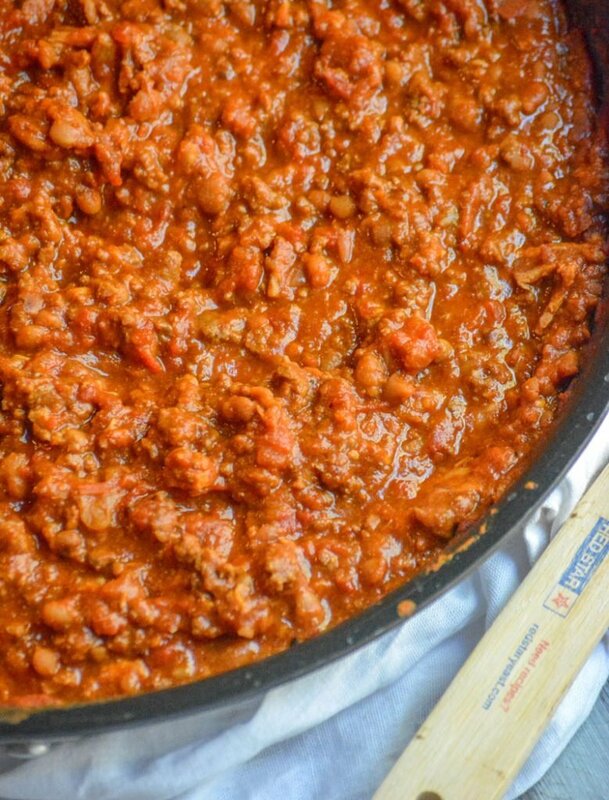 Reduce the heat to simmer, and stirring occasionally, simmer the chili for 2-3 hours. We prefer an really thick chili, but if you enjoy yours on the thinner side- add a bit of beef broth until the desired consistency is reached. 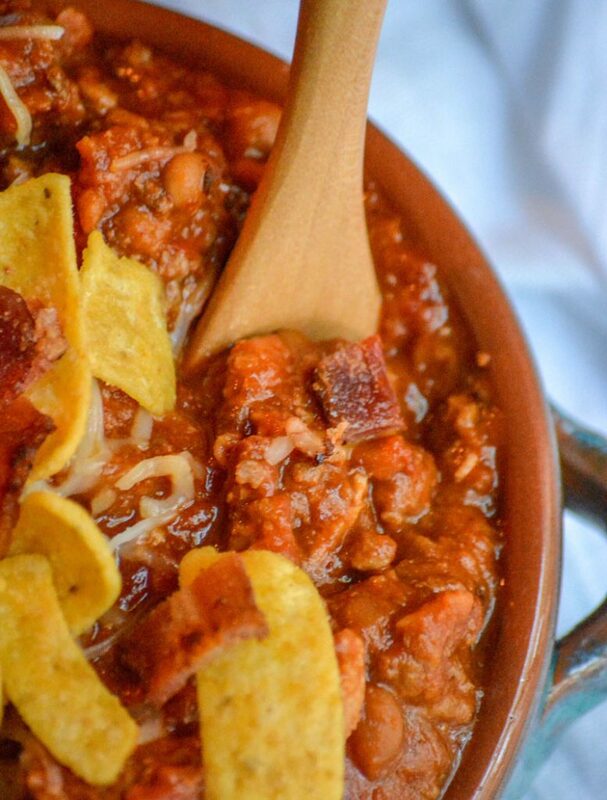 There’s no more love that could’ve been given, than with this Ground Beef & Bacon Baked Bean Chili. It’s like Grandma had a hand in game day grub. So good! 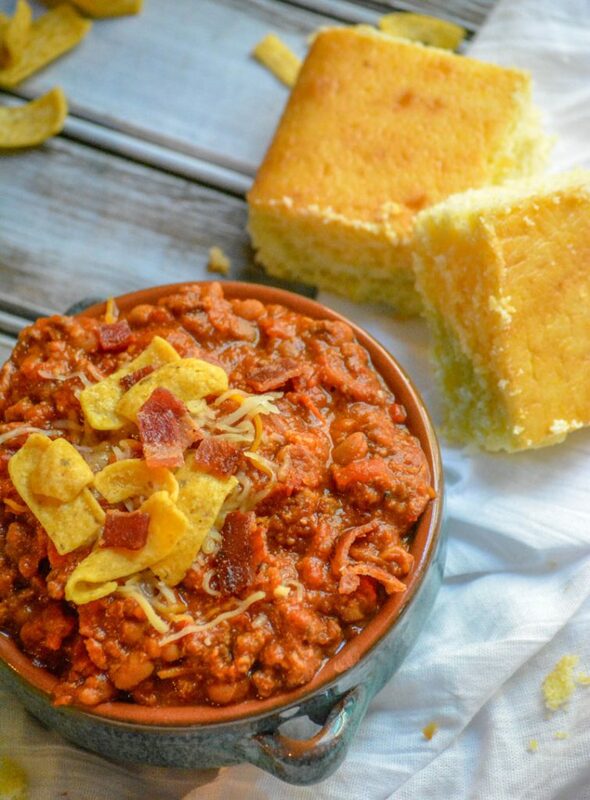 A heart chili with a base of baked beans, this version is infused with crumbled ground beef, bacon, and an added bit of sweetness from maple syrup. Add the bacon, beef, and onion to a large skillet. Cook until everything's cooked through. Drain all of the fat. Transfer the meat mixture to a large pot. Add the canned tomatoes & beans to the pot. Stir in the broth, along with all the seasonings, and syrup. Bring the chili to a boil. Stir, reducing the heat to a simmer. Cook, stirring occasionally, for 2-3 hours or until the mixture's thickened and all the flavors have combined. Best of both world this, chilli and pasta! My son loves chilli, my daughter loves pasta, it’s a sign! I have to make this this week now.